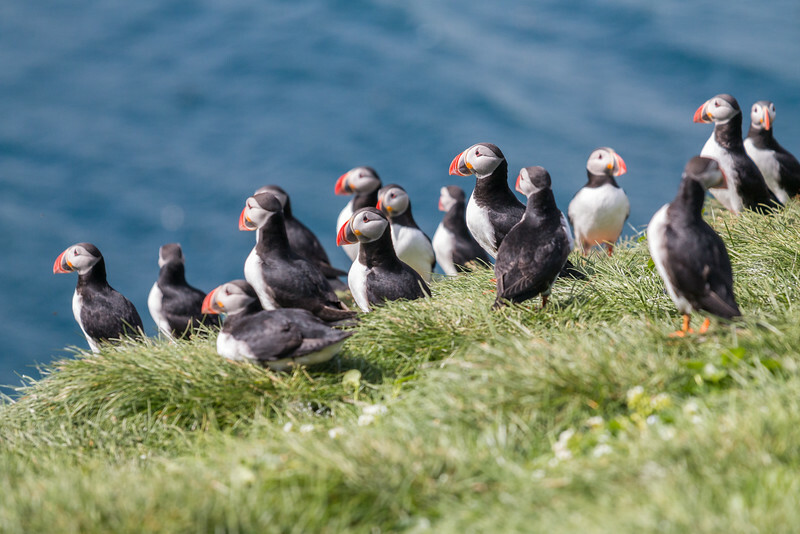 Puffins are Iceland‘s most popular bird for a reason. With their orange legs, striped colorful beak, and black and white plumage, these small birds are adorably cute. And, if you want to go Puffin watching, a summer road trip in Iceland is a great opportunity to see them from a close distance. Entertainment guaranteed! 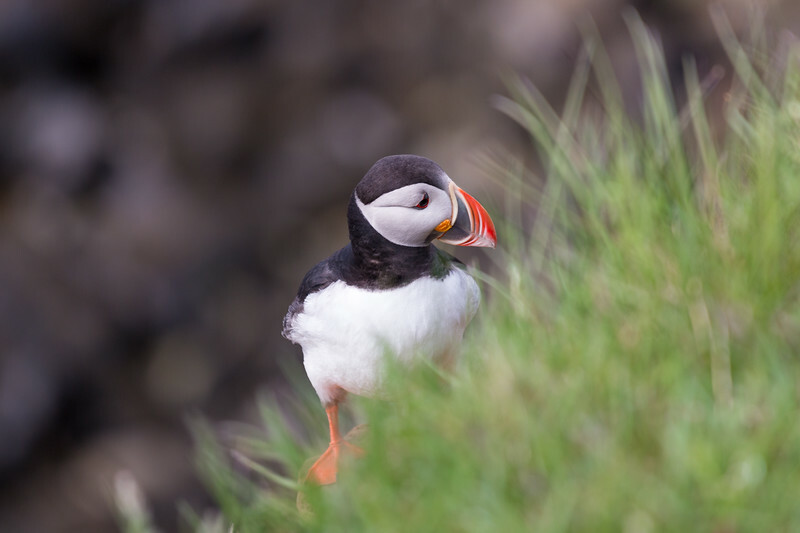 Millions of Atlantic Puffins visit Iceland every year to breed and you can find them at various locations along the country’s coast, of which cliffs are they preferred and ideal environment. Cliffs are perfect for nesting burrows. 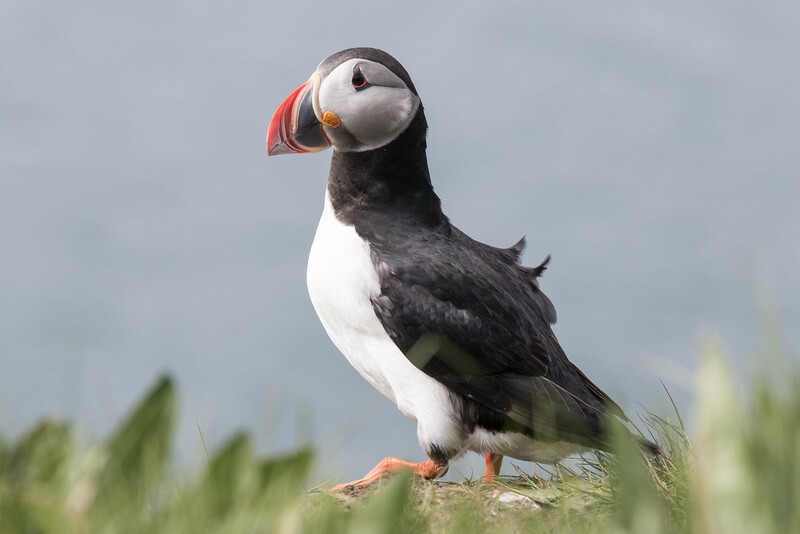 When Puffin watching, you’ll also encounter many other birds such as Arctic Terns, Northern Gannets, Guillemots or Razorbills. Iceland is actually a very good place for bird watching in general! In case you’re wondering, the Icelandic word for Puffin is Lundi. Puffins spend most of their life at sea, only coming ashore to breed, and this is when you’ll be able to spot them. The season usually lasts between May and August but, in certain places, it can start as early as April and finish as late as September (rare). The best time for Puffin watching is probably June as they’re more likely to be closer to their burrows. Because this is nature it is possible that it varies per location. More than half of the world’s Puffin population choose Iceland as their home base, returning year after year to a place that’s familiar to them. This is good news for everyone looking to visit Iceland and adding Puffin watching to their list of activities. There are various locations where you can see Puffin colonies in Iceland. These are spread across different regions and some are more popular than others. Not all are easily accessible or have the same numbers but in remote places Puffins tend to get closer to humans without feeling threatened. The most popular ones are Heimaey, in the Westman Islands, Dyrhólaey, on the south coast close to Vík, and Látrabjarg, in the Westfjords. Wherever you go, just don’t forget to bring your camera to photograph the Puffins. And if you have a zoom lens, you can get nice close-ups without disturbing the birds. We visited Látrabjarg, Grímsey, and Dyrhólaey. 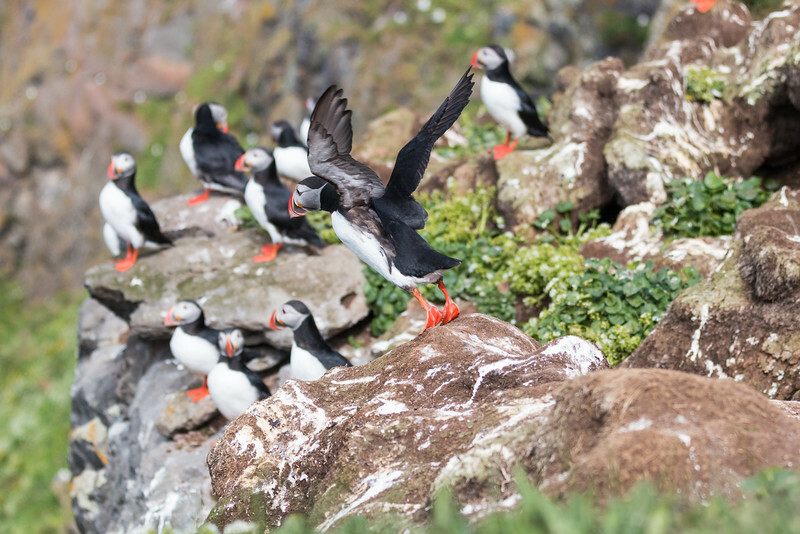 Get ready for photos of cute Puffins in action! 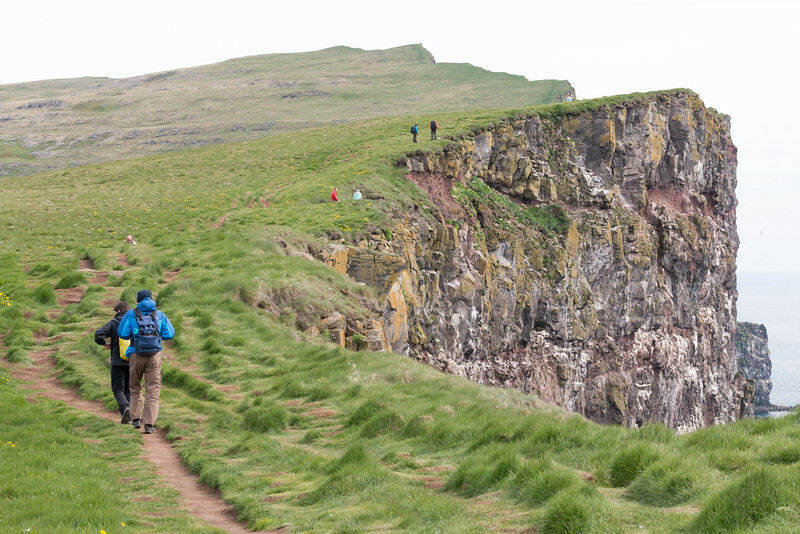 Látrabjarg is Europe’s largest bird cliff and with its 14 km of length and over 400 m of height, this is one of the best nature destinations in Iceland. Many bird species, with numbers in the millions, live or visit Látrabjarg, making it a perfect location for bird watching. Because Látrabjarg is quite long, we recommend at least a couple of hours to visit but half a day is definitely a better idea. Due to its distant location in the remote region of the Westfjords, not a lot of people visit Látrabjarg. Grímsey is one of those places that doesn’t show up much in articles about Iceland yet this small island on the Steingrímsfjörður fjord is the best place we’ve been to for Puffin watching. There were thousands of Puffins there and all within very close distance and seamlessly undisturbable. Despite the remote location in the Westfjords, the island is only a 10 min boat trip away from Drangsnes, a tiny village not far from Hólmavík. Well worth the trip! We’ll let the photos show you why. Dyrhólaey is a small peninsula on the south coast of Iceland located very close to Vík. 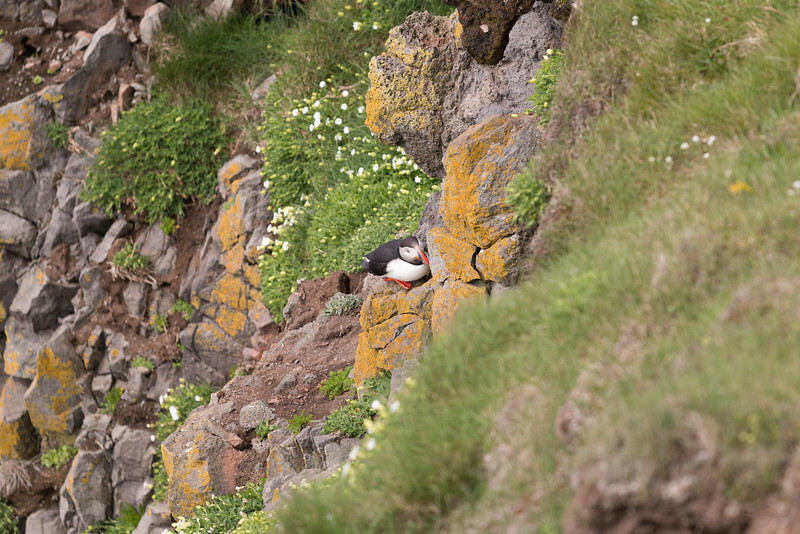 It is well known for its cliffs that numerous birds choose to nest, including many Puffins. The views from Dyrhólaey to the black sand beaches are quite famous. 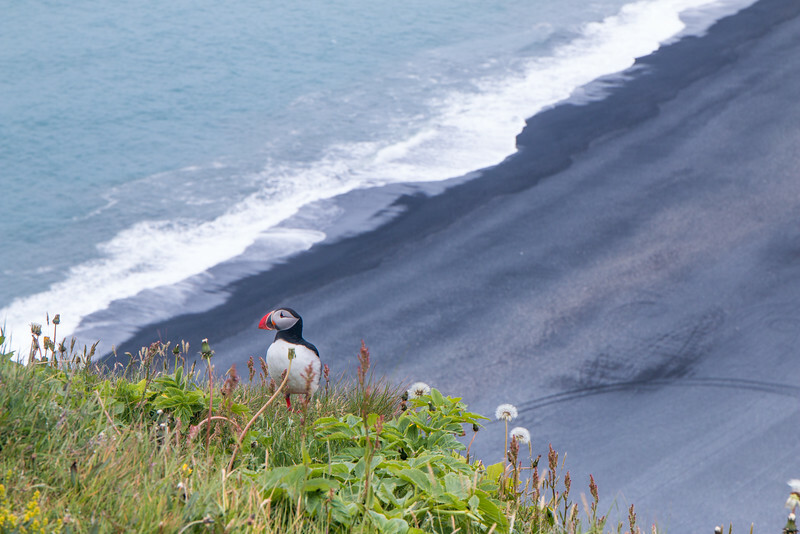 This is one of the most easily accessible Puffin watching locations in Iceland and one that most people get to visit. If you’re traveling in Iceland during Puffin season, don’t forget to stop at Dyrhólaey. 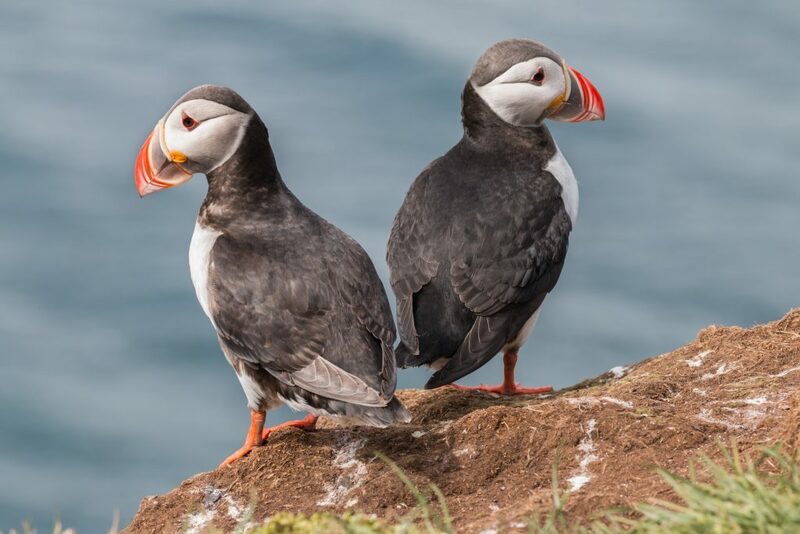 Have you been Puffin watching? In Iceland? Let us know in the comments below! 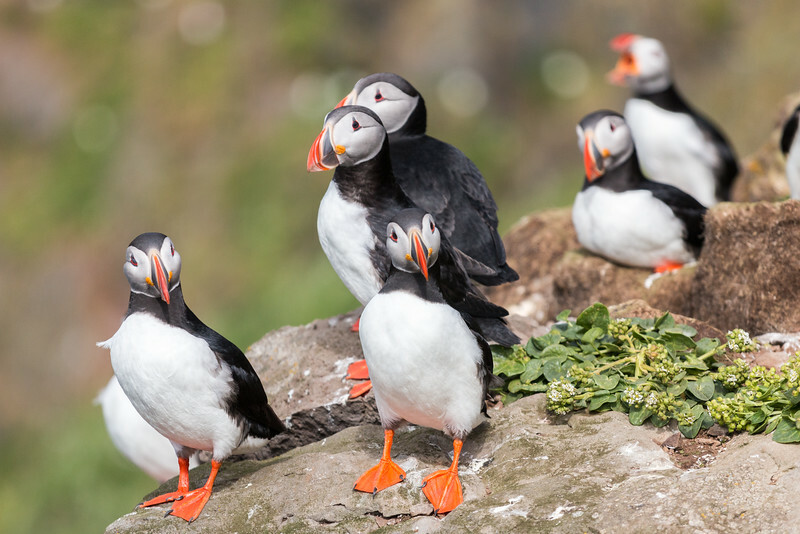 You put together a great list on where to find the Puffins. I have always wanted to see them out in the wild and for now have only seen them at zoo’s or aquariums. Good reason to head back to Iceland!!! BTW, those are some pretty awesome photo’s you took! Thanks, Nancy. Seeing them in the wild is definitely a great experience. Fascinating. I love seeing wildlife in their natural habitat. Puffins are such funny birds, I would love to see a cliff side full of them. You know what to do, travel to Iceland! I only have discovered recently about the Puffin’s! They look so adorable and like little plushy birds! Can’t wait to get to Iceland and see some! 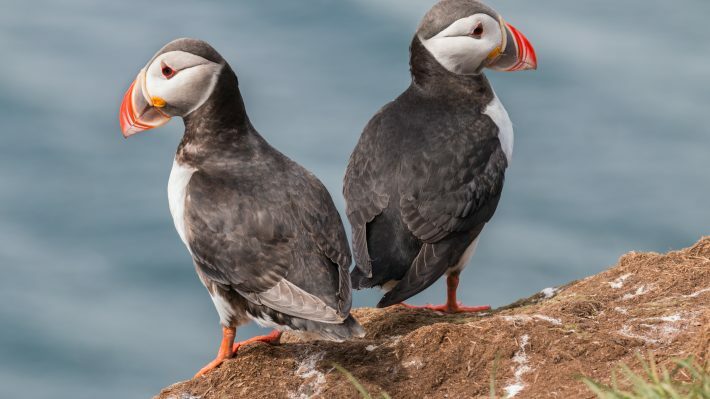 These photos of the puffins are gorgeous! Great wildlife photography. I love them so much! Although I have never seen them in person. I’m considering an Iceland trip in 2017 so maybe I can add puffin watching to the itinerary! Thank you, Juliette! Hope you make it to Iceland and see some Puffins. Such an adorable bird…I’m actually thinking its much cuter than even a penguin! 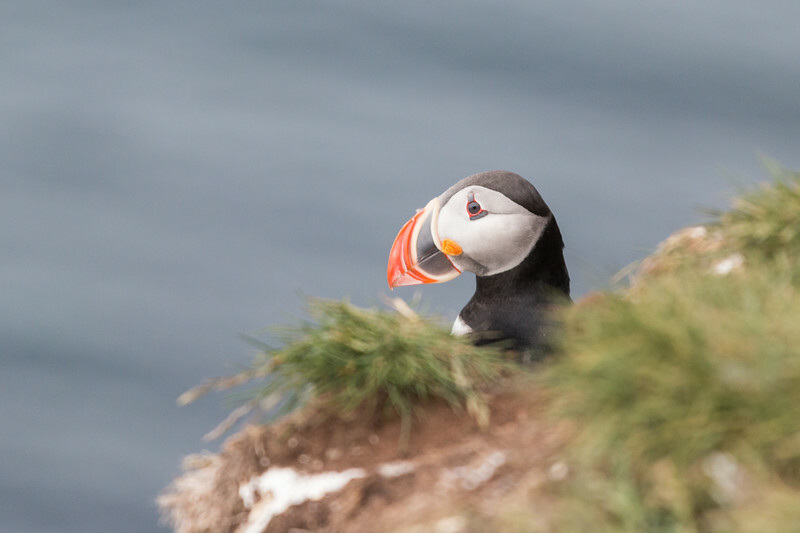 This post is so unusual….puffin watching…you’ve done your research really well! That’s a tough choice! Penguins are so amazing as well. Well, if I finally ever get to Iceland, I know where to find the puffins. They are just so dang cute! We have never been Puffin watching, what cute birds. My son and I watched a Nat Geo show on Puffins and apparently they can be quite vicious to each other. They fascinated my son. We are planning to visit Iceland and we will have to make sure that we visit when the Puffins are there. Great photos! If you do make it to Iceland, try to go Puffin watching. You’ll enjoy it! Looks really cute. I love the colors on their beak. This is for sure one of the things i would love to do in Iceland. While my kids would probably try and run around and scare anything that moves (damn boys) I would love to watch with my camera for hours! Ahah. They would definitely enjoy seeing them as well!